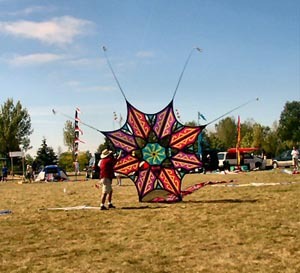 One of the incredible kites built by Jose Sainz of San Diego, California. 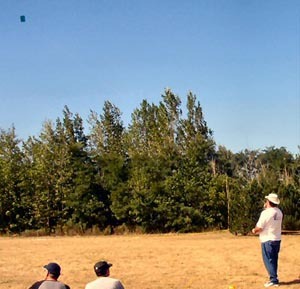 An Eric Curtis Boreal Kites Delta with a beautiful Cody War Kite. Crows!!!!!!!!!!!!!!!!!! What's up with that? 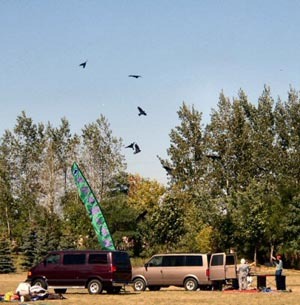 Actually, these are flapping crow kites made by Mr. & Mrs. Takakuwa from Japan. The New Zealand Star made by Jose Sainz. 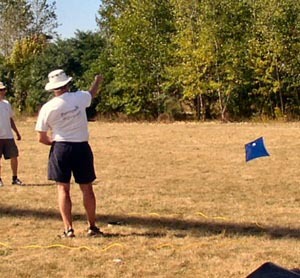 This kite won him the AKA Grand Master Kitebuilder title for 2002. Alain LaLonde of Quebec flew his legendary Cobra. Until it ended up in the trees! Uh oh, the Cobra looks like he is seeking revenge. Arlene and Dennis Ische and Rick Longhurst with the Ische Delta. The inflatables of Wolfgang Schimmelpfennig of Germany. Great kite builder and a great kite ambassador! Larry and Karen Green's Genki Vulture flies with Wolfgang's creations. The Raven's of the Zoone Collectif of France. 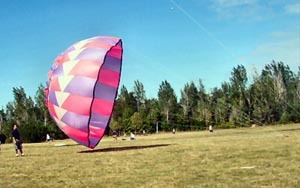 Lam Hoacs kite. Poetry in motion. Rick "The Albatross" Longhurst in his first fighter competition in Toronto. Rick flies against Dennis "The Mad Scientist" Ische. 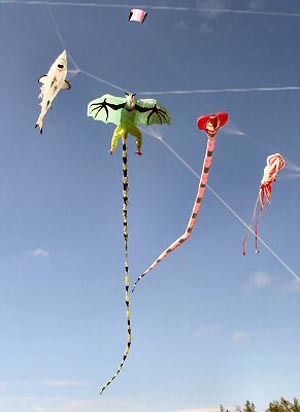 A stack of Dyna Kites. Invasion of the giant kite bugs.